We dreamed of a time when yarn would feed smoothly so that we could knit row after row without tugging, pulling, or untangling. Then, we realized that we could just re-envision a classic yarn caddy / Lazy Susan concept and create a flat-packable device that can sit and rotate on any quarter-inch shaft, including our Lazy Kates and Simple Kates. Tensioned with our patent-pending TensiTamer gizmo, the yarn feed rate is controlled--or not, if that's your preference! We'd say more, but we've already returned to our knitting…. Jasmin hasn't decided if she is going to pick Archer or Fading Lines . Gigi is knitting another preemie hat out of Malabrigo Ceresa. Jasmin mentions Alana from Never Not Knitting. She is also knitting another pair out of a purple stripe Patons Kroy and turned the heel on the first sock. Jasmin has finished the body of her Frozen Hearts sweater. Seed yarn in the Knitmore colorway(The Great Knit-off!). Fiberseed Company, Discount code for the pattern is "theknitmoregirls". Gigi cast on another preemie hat in the Malabrigo Ceresa. 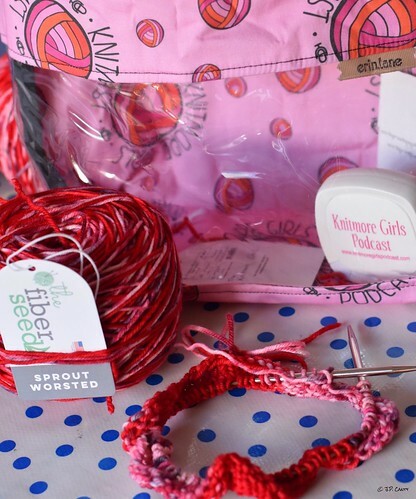 June 1st: Great Knit Off! Check out the Knit Girllls, rules are up! Go vote for your preferred changes to the rules. Jasmin has started her project for the Great Knit Off, and talks about Kombucha. Next project is a skirt. Worked on drafting a skirt sloper all weekend. Sewed one out of Swedish pattern paper. Sat down in it.